In the game of craps superstitions and myths have been prevalent since as long as people have been learning to play craps and the game has been around. Over the years, players have come up with plenty of different beliefs of their own and have stuck to them even though they are actually quite far from facts. Casinos operate for profit too and while they will be interested in winning at craps, the fact is that they do offer an even game to the players. It is up to the players to be smart enough to play the game right if they want to win at the game. Making the right amount of bets at the right time can even mathematically give the players odds of winning 99.4% of what they wager. Casinos will definitely want the players to lose at the game; however, the dealers are always hopeful that the player at their table do win because that is the only way that they will get a tip. Dealers will in fact be very happy about players winning at the table. On craps tables, the dealers are changed every 20 minutes. Twenty minutes on stick and then 20-20 at the two base positions. The dealer will then take a twenty minute break. When the shift changes, a dealer is overloaded with work or in any other such situations too the casino will have to keep rotating the dealer. This has nothing to do with the player winning or losing. Stickpersons do not just send the dice on a 7 in either case. However, at times the dice might tumble unintentionally or hit the chips when they have being sent to a shooter and they end up on a 7. In any case, most players shake the dice or set them up according to their preference. The fact is that the odds of a 7 being rolled is always one to six no matter what is believed. To know more superstitions which bring bad luck to a gambler, go to this page. There is nothing like a bad luck if one views the game of craps from a logical point of view. 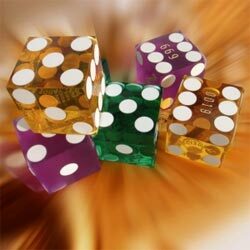 The odds of a particular number being rolled are always one to six even though the dice might bounce off the table. Usually, players who do roll out a 7 always complain about something which had been a bad luck for them. Many might consider a particular player being a good shooter if they manage to roll out favorable numbers. The fact is that there is no skill involved in shooting a dice and it is all a matter of luck which just goes to show that nobody can really be a good shooter.